Cairo is Egypt’s sprawling metropolitan capital city set along the Nile River and famous Giza pyramid complex. It is one of the region’s busiest travel destinations serving as a hub for Egypt Air, Nile Air and several other airlines. MRO Africa provides a unique platform for MRO service providers, suppliers and key industry professionals from airlines and aircraft operators to gather and expand relationships across all service sectors. Conference organizers from African Aviation Services Limited say this exhibition has grown exceptionally over the last few years and continues to expand with more exhibitors each year. 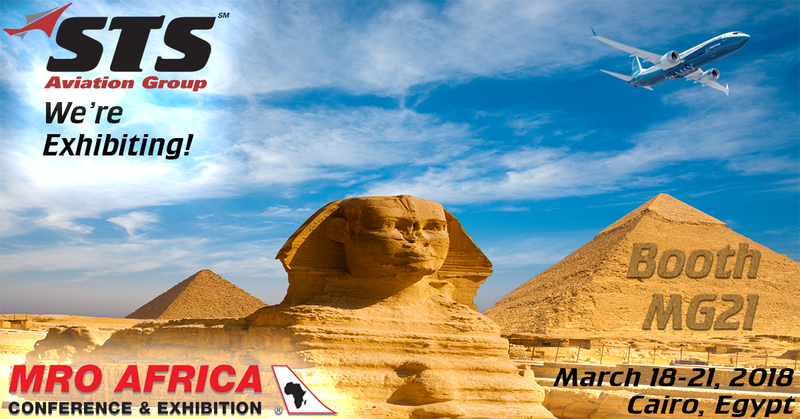 They are anticipating the largest exhibition yet for 2018 that will be attended by senior airline, aviation and regulatory officials from all over Africa as well as senior representatives of MRO organizations, supply companies, aircraft manufacturers and international companies involved in aircraft and engine leasing, aviation finance, aviation insurance and many other airline support services. You can expect networking events such as cocktail receptions and dinners, a tour of the EgyptAir Maintenance &Engineering facility and the MRO Africa Gala Dinner. Items for discussion during the conference include African MROs in the future, Keeping MRO costs down and operating revenues up, PMA parts debates and so much more! You can view the complete agenda here. Members of STS Aviation Group, David Ikeda (Vice President – EMEA, STS Component Solutions), Jim Naylor (Director of Sales – EMEA, STS Component Solutions) will be available to meet with during the conference to discuss any of your company’s aircraft & engine inventory and aerospace hose manufacture / distribution service and support requirements. This conference is sure to provide opportunities to develop new partnerships between MROs, suppliers and airlines within Africa, the EMEA region and beyond. Be sure to fly by Booth MG21 during the exhibition and meet the STS team. We really look forward to seeing you all in Cairo!